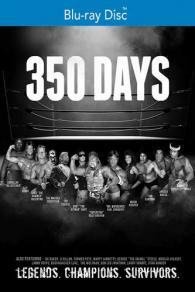 In 350 Days, pro wrestling legends Bret Hart, Superstar Billy Graham and dozens more peel back the curtain on the severe toll working on the road 350 days a year took on their bodies, families, marriages and psyches. This compelling documentary chronicles their struggles to survive the chaos of 1980's era wrestling. Living a rock and roll lifestyle, they faced nightly temptations, battled their vices, and were absentee parents and spouses while chasing dreams of fame and fortune. In their own words, with the cutting insight and sharp wit one would expect from such legendary icons, these gentle giants tell their harrowing (yet often darkly humorous) tales as marriages dissolve and relationships with their children are strained, sometimes permanently. Such is the life of the professional wrestler; such is life itself.